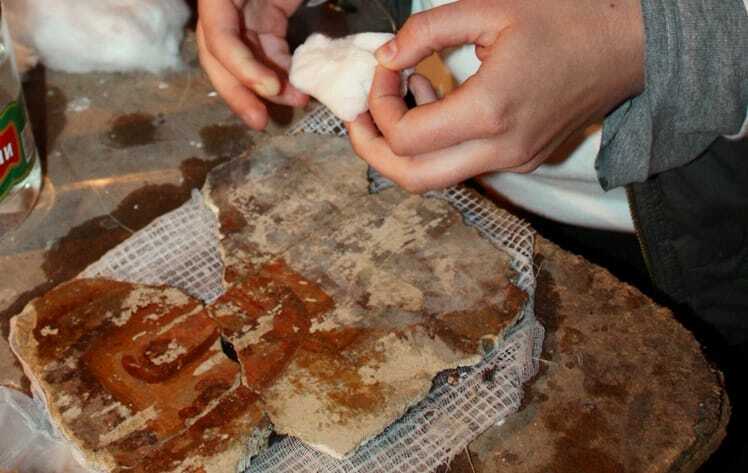 The both Balkan Heritage Field School projects: WORKSHOP FOR CONSERVATION AND DOCUMENTATION OF ROMAN MOSAICS AND MURAL PAINTINGS and WORKSHOP FOR CONSERVATION, RESTORATION AND DOCUMENTATION OF ROMAN POTTERY AND GLASS started today in Stobi, Republic of Macedonia. What is in the menu this year? Numerous authentic Roman and Late Roman shards, mosaic and mural painting fragments from the “Theodossian” Palace and the Episcopal basilica in Stobi, a lot of fun and trips around Macedonia and Greece.